The end of the Seven Years’ War would cause major changes in the relationship between Britain and the colonists in America. Colonists had come to think of themselves as a separate country after years of being left alone by the British (a concept known historically as “Salutary Neglect”). The British Parliament had been content to leave the colonies alone as long as people were making money off the cheap raw materials from the colony. The amount of debt the British created during the Seven Years’ War would cause a policy shift in Parliament in which they would ask the American colonies to help pay for the debt. To the British they felt it was only fair for the colonists to help pay since they had spent millions of pounds (British currency) sending soldiers to the American colonies to help in the war. introduced to the American people, including the Navigation Act (1651), the Sugar Act (1764), the Quartering Act (1764), and the Stamp Act (1765). One of the most controversial early laws that colonists rejected was the Proclamation of 1763. The British were aware that the Native American people were upset about the consistent expansion of colonists into their lands and wanted to halt this movement to keep relations calm with the Native Americans. It was perfectly understandable to the British for this to happen since they were worried about France continuing to instigate issues between the Native Americans and the colonist, so any deal to calm these fears would be appreciated. 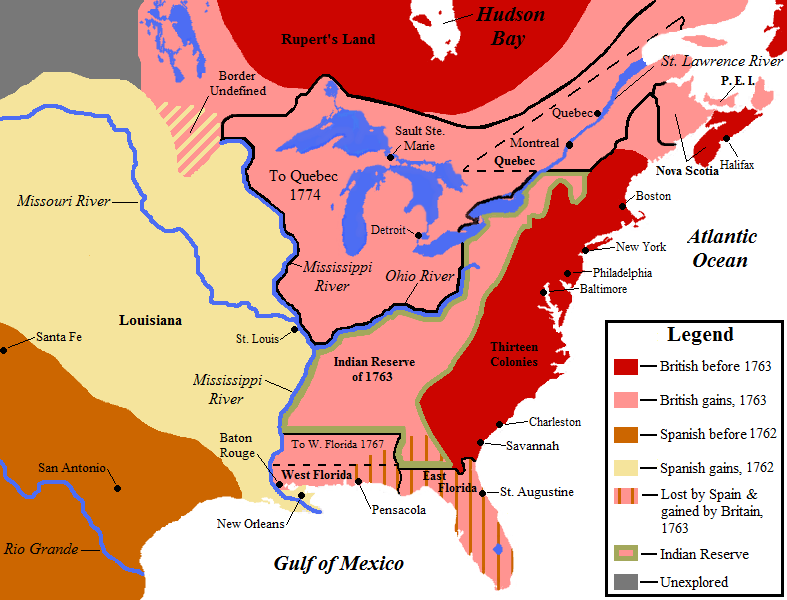 The colonists, however, were highly upset because they believed they had been fighting for the right to settle in these areas during the Seven Years’ War. Colonists would ignore this law that bound them on the eastern side of the Appalachians, and start to move west to settle anyway. This open defiance of a deal that the Native Americans had signed would cause continuous fighting for the foreseeable future. The colonists would reply to these changes by coming up with their own logical arguments to refute the necessity of these laws. The most logical argument that was developed during this time was the fact that the British were technically breaking the Magna Carta (their constitution) by taxing the colonists without giving them representation in Parliament. The British instead viewed the American colony as “virtual represented” because of the logistical problems that would come from representatives having to constantly sail between England and the colony. In their view, any representative would spend so much time in transit that it would be impossible to do their job well (not really knowing the needs of their people). The slogan “Taxation without Representation” would be used by the colonists for years as a legal reason for their problems with Britain. It should be noted, though, that most colonists weren’t actually interested in fixing the representation problem, but in going back to the freedom they had before the Seven Years’ War.